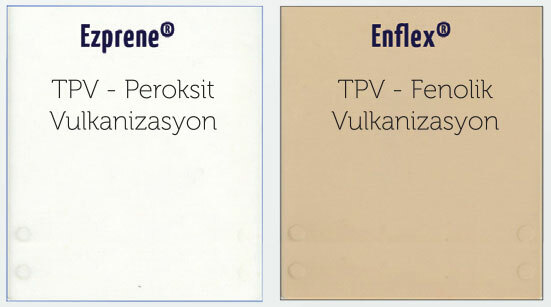 Most TPV products on the market are moisture sensitive. We have recently developed a new proprietary cure system and manufacturing process to make non- hygroscopic TPV products. Since these products are not hygroscopic, they do not need drying prior to thermoplastic processing. The new products have excellent physical properties. They also exhibit improved color with low yellowness for the ability to color match a wide range of colors with very little variation or color drift. These new materials have good oil resistance and mechanical resilience properties that are superior to other TPV materials. There are currently several grades in the new EZPrene® series, ranging in hardness from 55 to 85 Shore A. Each material has been developed to offer injection molders lower viscosity which gives you: shorter fill times, longer flow paths, and lower injection pressures. And, like every product in the EZPrene® family, they are non hygroscopic, so they require no pre-drying prior to processing. The new EZPrene® grades flow so much better and injection molding cycles can be as much as 25% shorter compared to traditional vulcanized thermoplastic elastomers. Initial evaluations of molded parts indicate that surface aesthetics attainable using EZPrene® materials are superior to those achieved using conventional vulcanized thermoplastic elastomers. Gloss levels are low, have little variation ftom batch to batch, therefore more consistent and weld lines are much less apparent. Materials in the EZPrene® series are very stable, and they can be processed at lower temperatures than standard TPVs. If necessary EZPrene® can be processed in a wide temperature window up to 230°C without showing signs of degradation. Processing at elevated temperatures accelerates and improves bonding to other TPVs in applications such as corner moldings for automotive weather sealing. In soft-touch or flexible injection molded parts, the new EZPrene® materials are ideal for hard-to fill molds, such as parts with very thin walls or those involving long or complex flow paths. The excellent surface aesthetics produced by these elastomers is particularly important to designers of automotive interiors. An extensive body of weathering data has shown these materials to be UV stable in use. In addition, these products exhibit chemical resistance, oil resistance, and compression set comparable to thermoset rubber. Because the cure technology common to all EZPrene® materials results in a clean, consistent natural, the new EZPrene® materials can be easily produced in black or in a wide range of colors, including the lightest pastels.